Lets make a brief overview of the parts that go into a hydraulic sorting system. In future posts, we will talk about each in detail. The pump unit for sorting gates can be similar to the type that operates a car hoist or small industrial unit. Depending on the size of cylinders you use, the size will be from 1.5 to 5 gallon per minute, and typically an operating pressure of less than 1,500psi. “All in one” units can be purchased from most hydraulics supply companies and I would recommend using a readily available one that can be serviced in case of break down. You can build a custom one as well if you are handy that way or have a machine shop that is experienced with making hydraulics parts. 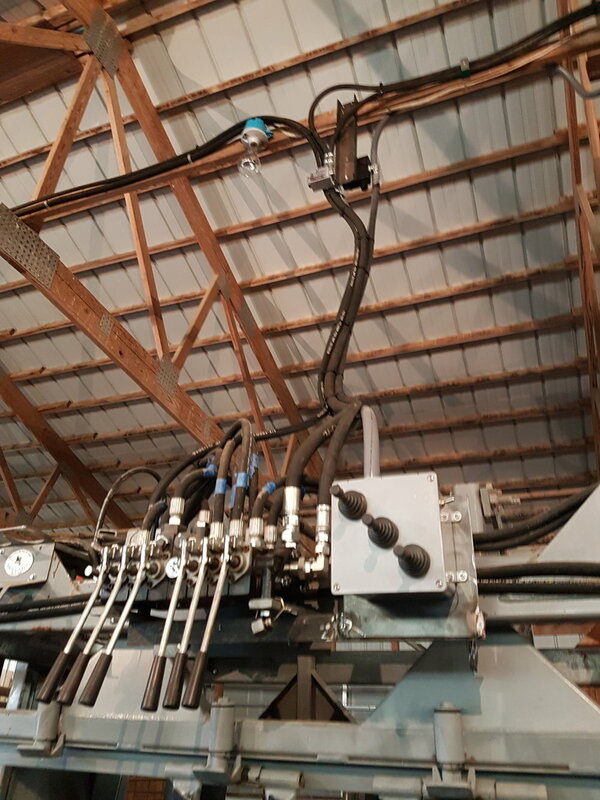 An alternative that we will talk about in the next post is to use a hydraulic chute to power your sorting gate, this works perfectly good if some guidelines are followed. I like to add filters and flow controls to the hydraulic unit. These are not required, but do give some nice benefits and give longer life to the system and less problems with the electric valves becoming stuck with contaminates. Hydraulic valves on an alleyway. The next step in any hydraulic system is the valves, Here you have a few options. if your cylinders are close together and close to where you want to stand to operate them, you can use simple manual valves. This is the simplest way to plumb any system but you don’t want to use this on gates that are far away from your valves. Electrical over hydraulic valves mounted on a manifold. These control the tub and also the alley. The second option is to use a bank of electrically actuated valves. You can buy manifolds that can hold a whole bunch of valves, then operate them from a switch board or remote control. These have the advantage of putting the controls at a different place than the valves and cylinders. But your cylinders should all be fairly close together. This works best for controlling a tub and alleyway. 2 tub gates and 2 to 5 controls on an alley are all close together, but it’s nice to control them from the chute or behind the tub. Electric over hydraulic valve in an enclosure. The third option is to use electric valves that are mounted near the cylinders with a hydraulic hose connecting them in series. This is the option you want to use if your gates are both far from the controls and also far away from each other. With a system like this, you can operate gates up to about 200’ away with no problem. Hydraulic cylinder on a gate. The last part in any hydraulic system is the actuators. These are the cylinders or motors that do the work that you want to do. For moving a gate, you actually don’t need a big cylinder. I usually use a 1.5” bore cylinder, usually 12” to 16” in stroke. Any type of end will work, but I prefer cross tube type and I have some special mounting brackets to work with them. You want the cylinder to be strong enough to move the gate, but not so strong that it will crush people who get hit by them. You should be able to stop the gate fairly easily by pushing on the end of it. If it can push you over, you need to turn your pressure down, or get a bypass for that cylinder. The brains of the system is the valves and control units. The valves are really common type that is used on lots of agricultural applications like feed trucks. They use an electrical current to activate an electromagnet that pushes a valve into position the same way you would when you move a lever. These can work with typical AC and DC currents, but the most common are 120vac and 12vdc. however, I prefer to use 24vdc ones because they have a longer range than 12vdc and are safer (and less restrictions on the wiring) than 120vac. I am demonstrating how you can use a wireless Magnetek Flex EX type remote unit to operate gates. The control for these valves can be a very simple switch. All you need to do is connect a circuit to the valve and it will work, so a simple toggle switch you buy at your local NAPA will work. you want a SPDT momentary switch for two way control. The other way to do it is with a remote control unit like the Magnetek FLEX EX2 system. I have used these systems and their predecessor for 10 years and they are an absolutely awesome system. They work very simple, you push a button on the handheld unit, and the central unit closes a relay, connecting a circuit. You can set them up for very simple systems, or very complex ones. I’ll talk in more detail about all this stuff in another post. If you want to have a great system, you need plan it out and work with someone who knows this kind of stuff. It’s not rocket science, but it can get expensive if you have to make 15 trips to town to get the right part. It’s better to draw out every single little part and go over it with someone who’s experienced before you start buying parts. Older Post6 tips for installing a gate you'll be happy with.